Passed away Saturday March 30, 2019 at the age of 99. Margaret was born April 29, 1919 to the late John and Nettie (Yutzler) Klopfenstein. 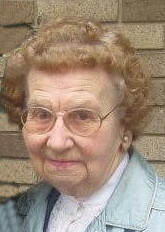 Margaret was the last remaining graduate of East Canton High School class of 1936. She taught at East Sparta Elementary and retired from Canton Local School District in 1974, where she taught at Amos McDannel for 32 years; she also worked on the family farm. She was a member of Trinity United Church of Christ, the Akron Orchid Society, Magnolia Grange, Molly Pritchard Lodge #10 D of A and Retired Teachers Association. She is preceded in death by her husbands, Ray Clapper Jr. in 1961, Rev. Raymond Hartmann in 2000; daughter-in-law, Darlene Clapper; grandson and granddaughter-in-law, Rick and Renee Clapper; three brothers. She is survived by the family she adored, twin sons, Richard (Flo) Clapper and Robert (Marie) Clapper; one step-daughter; grandchildren, Cindy Topp, Mike (Beth) Clapper, Michelle (John) Parker, Cherie (Mike) Mountain, Debie (Jerry) Davidson, Mark (Christa) Clapper; great-grandchildren, Donald (Emily) Hester, Nichole (Dude) Nelson, Darla (Scott) Schwab, Diana (Chris) Flounders, Crystal (Joshua) Solvey, Joshua (Chelsea) Clapper, Andrew (Alexis) Parker, Matthew Clapper, Tara Clapper, Marissa Mountain, Makayla Mountain, Dakota, Colton, Carter and Carson Clapper; and 11 great-great-grandchildren. Funeral services will be Thursday April 4, 2019 at 11:00am in the Sanders Funeral Home in East Canton with Pastor Steve Stewart officiating. Burial will be in Paris Cemetery. Friends and family will be received Wednesday 5-8pm and one hour before services on Thursday (10-11am). Condolences or fond memories may be shared online at www.sandersfuneralhomes.com.